In 1892 Veli and Mali Lošinj became climatic spas. The Island of Losinj has the Mediterranean climate with light winters and not too hot summers. The sea has a dominant influence because the Island is far enough from the coast. That is why the winters are lighter and warmer then on the coastal part. Based on the temperature characteristics and the micro-climate Mali Lošinj is similar to the places on the Cote d’Azur (Cannes, Nice), while from San Krf and Palermo it has 1 to 20°C higher average temperatures. Sea temperatures throughout fall, winter and first days of spring higher then air temperatures. The cooling effect of the sea is appreciated during the hottest days of the year. If we take that the sea temperature of 20°C is pleasant for bathing, then the bathing season in Mali Lošinj could last up to 126 days, from the first week in June to the second week in October. 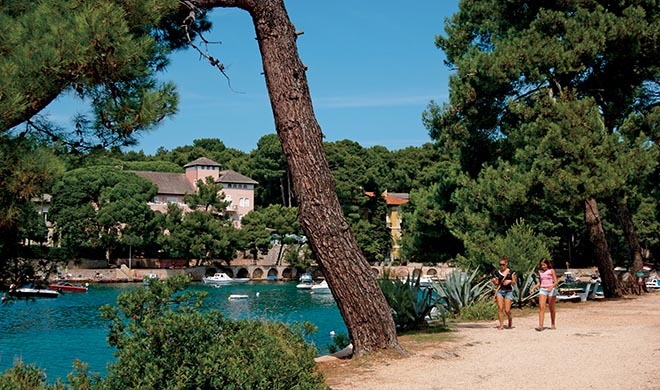 Sunny days are also one of the most important characteristics of the climate of Lošinj. Average number of yearly sunny hours is 2580. The frequency of the north-eastern wind is highest during fall, winter and spring. The north wind is strongest in January, while the south wind dominates during the fall.